Brother Kevin Crowley, the renowned founder of the Capuchin Day Centre in Dublin which daily feeds nearly 1,000 of the capital’s homeless, is to be awarded the Freedom of Dublin. The decision was taken by Dublin City Council and welcomed by the Lord Mayor, Christy Burke. Br Kevin will receive the honour with Irish soccer legend, John Giles, early next year. The decision follows the bestowing of the Freedom of Dublin on Fr Peter McVerry and rugby international Brian O’Driscoll earlier this year. Other recipients include former US presidents John F Kennedy and Bill Clinton, Nelson Mandela, Mother Teresa, the members of U2, and Burmese democracy leader, Aung San Suu Kyi. 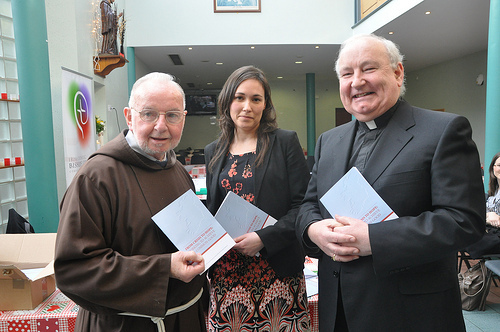 Br Kevin founded the Capuchin Day Centre in Bow Street in 1969 to help homeless people in Dublin. Initially, the Centre fed 50 people a day but by 2014 that number has risen to 800 people a day – 300 for breakfast and 500 for lunch. In addition, the centre gives food parcels to those in need and currently up to 1,800 a day receive parcels to help feed their families. In recent years, Br Kevin has warned that the homeless crisis is getting worse. Only in 2010, 400 people were receiving food parcels but that had reached 1,600 by 2013. “We’ve had some very sad cases, such as a mother who had a son doing the Leaving Cert and the daughter the Junior Cert who had to do exams one morning without breakfast because both she and her husband had just lost their jobs and what money they had they were trying to keep to pay the mortgage,” he said. He explained that the centre on Bow Street was also of great benefit to many senior citizens, some of who are lonely and isolated and almost afraid to switch on the light for fear they will not be able to pay their fuel bill. Government funding for the centre totaling €450,000 per annum hasn’t increased since 2007 and the running costs are €2.1 million. The centre must plug the shortfall through donations. “We depend entirely on the generosity of the people. I trust in God and thankfully there are many good people out there, even in this time of recession, voluntarily organising golf classics, coffee mornings, quiz nights and other events as well as donations from all over Ireland and beyond,” he explained.